What’s going on at East Village Cheese? I went to East Village Cheese (review here) a few days ago to stock up on a few staples & I can’t help but think that something has changed there. A few staples that myself & other family members buy (Boursin & Saga blue cheese, both running at an insanely cheap $1.50 for 8oz.) are no longer stocked & the place just feels, well, different. The rumor mill (my father) is abound with theories that the store was bought out recently, but I’m not sure what to believe. I did some fact checking (Googling) & all sources tell me that Thupten Tenphel and Lobsang Tsultrim are still owners of the joint. Am I being cray-cray here or has anyone else seen a bit of a change at the shop? I agree with you. 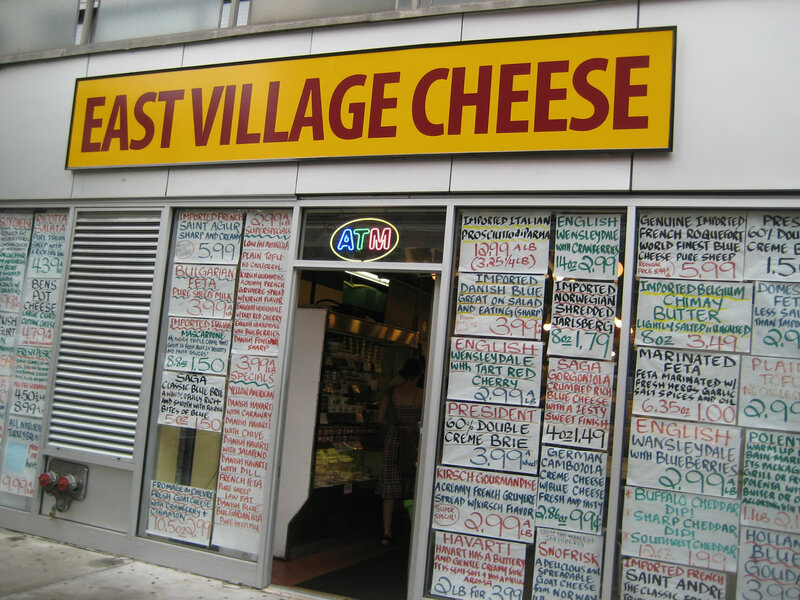 I have always heard rave reviews about east village but the passed two cheese I have purchased there have made me and my roommates sick! One was an old brie and the other was a parmesan that tasted like plastic and fish–yuck. I purposely ran to get there before 6:30pm which is when they close and at 6:20 the guy locked me out! They need some new energy in that place! I have read all the reviews and I have to say I am quite disappointed with what I found when I went into the store today. I was NOT impressed with there cheese selection, Zabars has more. But when i asked for which cheese I would like and the amount, They didn’t understand because the guys taking orders bearly spoke english. I also asked how many people could I feed with 1 pound and they couldn’t answer, I got a confused look. Luckily a kind woman (caterer) was able to help me. I asked them to label the 3 cheeses. One man pointed to the cheese while the other stumbled with trying to write it down. The cashier also didn’t understand english. This could be a great store but with the service hired, no help with cheese advice and poor attention I give it a thumbs down. Disappointed. Yes, I do believe they were bought out at least 2 years ago, if not more. The people that worked there (particularly, the two Latina ladies that were there for years) are no longer there. There is a “RUSH” attitude in the place, and they do not respect the customers like the old regime did. Too bad…I used to go there for all my holiday party needs…Not anymore…Would prefer to give my money to Russo’s on 11th Street between 1st & 2nd. They are a small old-style Italian deli with homemade pastas, the best semolina bread I’ve had since Arturos’ on Arthur Avenue and some great antipasto. Although they don’t have as much variety in cheese, they do have most of the staples. And the customer service is GREAT!